A baby supply company is recalling more than 425,000 play yards after a 10-month-old boy was strangled. The play yards were manufactured in China. The boy was inside Kolcraft Enterprises Inc.'s Sesame Beginnings Travel Play Yard and the restraint strap from the elevated changing table hung down into the main play area and strangled him, according to the Consumer Product Safety Commission. The company is recalling twelve different play yards with changing table attachments that have that type of restraint strap. "These play areas have a serious design flaw that poses a strangulation hazard," agency spokeswoman Patty Davis said. "We don't want that to happen to any other children." 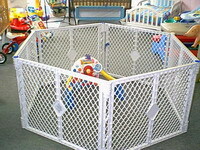 Kolcraft spokeswoman Diane Steed noted that the changing tables have warnings telling parents not to put children in the play area when the strap attachment is on top. "We would stress to parents again:`Do not put your child in the play yard when the changing table is on top,"' she said. One of the play yards, Contours 3-in-1, also features a rocking cradle attachment that sits on the top of the main play area. A child who rolls all the way to the side in the cradle could get stuck between the cradle and the mesh wall of the play yard. If there is a blanket or another material thrown over this wall, it could block the child's mouth or nose and pose a suffocation hazard. The company has received 45 reports of children rolling to the side and getting stuck in this manner, but no reports of injuries.